It's been a while since I last reviewed any books in the Then and Now series and I thought I would choose New Orleans and Hollywood - New Orleans as a tribute to this great city I visited three years ago and whose life has since been turned upside down. Hollywood because two weeks ago I was right there. New Orleans' history goes back a bit and although much has changed, when you visit the city, not much looks that modern which is wonderful for the visitor. Thankfully so many old photos were around for this book so the comparisons are great fun and interesting. Some buildings are still around while others have disappeared over the years, Hurricane Katrina notwithstanding. One of my favorite duo of photographs is across pages 34 and 35 - almost exactly the same as it was in 1890. Many of the modern day photographs reflect a dour sky with no blue in sight which doesn't bode well with tourists. I remember it raining constantly for the day and a half I was there. However, there are some pictures with bright blue sky, so the sun does shine. This fascinating city, home to Mardi Gras, the birthplace of jazz, its French history, and much more, will always be a top tourist attraction. Until this city recovers, you can enjoy her through these lovely pictures. I say, Go well, New Orleans. Ironically, in the introduction it says, "New Orleans has been called by urban geographer Peirce F. Lewis, "The impossible but inevitable city. Impossible because no one in his right mind would build a city in the midst of a hurricane-prone and disease-ridden swampland continually subsiding below sea level"". Go well, New Orleans. 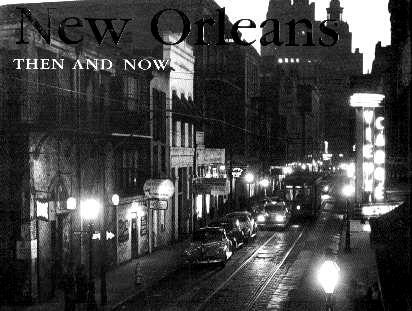 NEW ORLEANS Then And Now may be purchased and/or ordered through your local bookstore. Conclusion - A must for lovers of great city books.